The Michigan DNR has reported on the current state of efforts to battle and contain the two wildfires threatening areas around some of Michigan’s most prized and familiar trout fishing territories. The MDNR is listing the larger of the two fires, the Meridian Boundary fire, as contained but not under control. 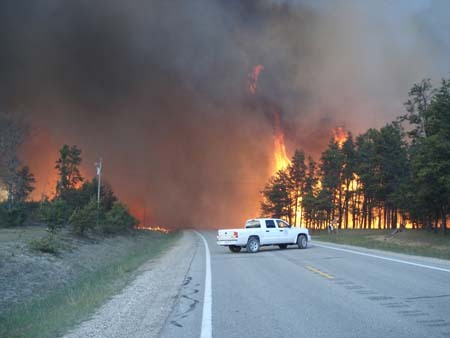 The fire has burned approximately 7520 acres at this point in an area adjoining the South Branch of the Au Sable River, south of M-72, in South Branch Township. The MDNR has confirmed that a number of homes have been lost to the fire, but so far no reports of injuries or deaths. M-18 is currently closed from M-72 down to the Roscommon County line. The fires has been moving south with the wind through the jackpines. The north line is said to be more under control, though the fire has come within one-half mile of the Mason Tract Chapel. The MDNR reports as well that the cause of the fire was burning debris. The Range 9 fire is located in Kalkaska county on land adjoining the Manistee River south of Portage Creek. Reports are that that fire is contained and mostly extinguished. It has burned approximately 1040 acres. That fire started out as a controlled burn on a Camp Grayling artillery range. There are reports that the fire has destroyed some homes in the area.